Water damage is a prime culprit that weakens the foundation of any house. Damage from water hits at the core of your home that results in severe structural damage. Plus, water causes mould and mildew in the house. Thus, employing waterproofing services is essential to a stable and secure home. Know that taking preventive measures for inevitable water damages from before is cheap than paying for waterproofing solutions and repairs later. Continual leaks cause mould and mildew in the walls, rot the surfaces, and give birth to termites and carpenter ants. But, if you fix the leak as soon as it starts, there may be no damage at all. Look for dark spots under sink cabinet pipes. Examine if there are any stains on ceilings, if the toilets are rocky, or see if there is any dripping happening. Inspect roof at least once a year. Repair loose and damaged shingles. Repair cracked caulking, if any and look for leaks around flashing. Cost of maintenance: Close to no charge for a simple fix like a new washer. But a visit from a plumber or a roof repair person may cost you a certain thousand rupees. Worst case if you underestimate leaks: In case you haven’t employed proper waterproofing products in securing your home, water drippings under the kitchen sink can ruin the cabinet and water can further run down into the floor sheathe and joists. Hence for correction, first of all, you’ll need structural repair, new cabinets and also new kitchen flooring. To stop drippings from roof rots, you’ll need a new roof. Why is good drainage required? Poor drainage system under your house weakens its foundation, which results in cracks, and pathways for water to enter in the house. How to ensure proper drainage? Get your gutters cleaned regularly as a clogged gutter sends pours of water down your house that damages the foundation. Ensure the downspouts of your home, if any, direct pool 10 feet away by employing correct waterproofing services. Make sure that your yard is sloped away from your foundation to keep water from getting near to foundation. This way water won’t be able to lean your walls, crack masonry, or create leaks. On the other hand, do not let the soil around your home get too dry. Prolonged dry spells dry out and shrink the land, and a heavy rain expands the ground to the extent that the soil can pressurise your foundation walls. Cost of maintenance: Low. Cleaning gutters cost nothing. You can also hire someone depending on the size of your home. Also, to give the slope to your soil, you might have to buy some topsoil. Worst case scenario if you let drainage be: Your foundation could be pressurised and it can crack your basement walls. The cost to restabilise and repair your deteriorated foundation walls is in lakhs. Sump pumps are used to remove water accumulated in the sump basin of the basement. They are required the most during rains. Now, you do not want to realise during rain and storms that your pump is not working. Keep a check on it at least once a year, particularly before heavy storm seasons. Cost of maintenance: Testing of a sump pump is free. A backup sump pump with installations may cause around 10,000 rupees. For battery-operated sumps, the new battery starts at about 7,000 rupees. 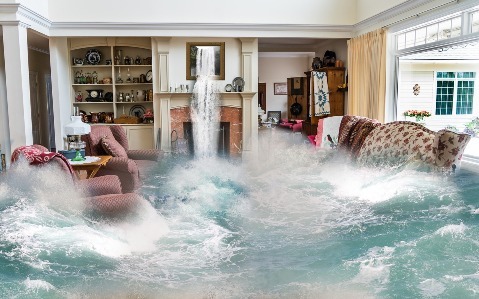 Worst case scenario if you do not test sump pump: Your foundation may flood, which could ruin everything from wall to carpeting. Correcting foundation can be expensive. So now you know how water from rain can cause and lead to severe damages to your place of residence. As explained above, prevention is better and much cheaper than cure. Employ preventive measures and save your home from significant disasters. You can make use of Dr Fixit Waterproofing Expert solutions for waterproofing of your homes.